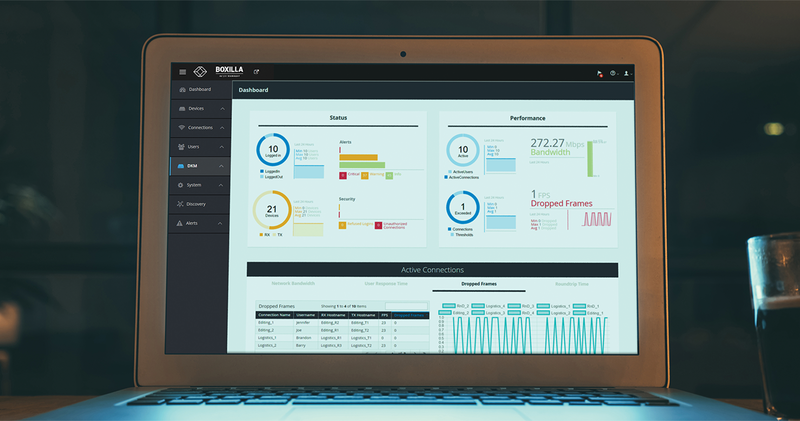 Boxilla works in conjunction with the Emerald KVM Platform, InvisaPC and DKM to give you full monitoring and control of not just devices, but your entire KVM system, all across the enterprise. Control user access. Monitor device status. Proactively identify and address potential performance problems before they occur. Upgrade thousands of remote endpoint devices with one click, without ever leaving your seat. KVM management has never been easier. The power Boxilla unleashes for the Emerald KVM Platform is only the tip of the iceberg. Because it's a software-based solution, it's also a future-proof solution. Forthcoming upgrades to Boxilla will enable support for other Black Box product families to ensure you always have the most up-to-date software for your KVM and AV/IT system, and KVM network. InvisaPC is a plug-and-play, hardware-based KVM solution that, on its own, supports access to a maximum of 32 physical and/or virtual servers for each user. Boxilla scales the InvisaPC matrix from 32 to an unlimited number of devices and adds enterprise-level KVM and AV/IT management and control.